The ADXW Expert analyzes the market and identifies the market entry points based on the signals of the Average Directional Movement Index by Welles Wilder indicator, or the Average Directional Movement Index (seleted in the settings). It also has multiple methods for maintaining deals, which allows to reduce the drawdown and to start with a low balance of $100-200. It has a customizable system for limiting the operation during news releases or spread expansion. Lot - base lot for opening new orders. MM - Money Management (Free Margin, Balance, Loss Free Margin, Loss Balance, Constant Lot). Stop Loss(points) - stop loss in points of the current instrument. Take Profit(points) - take profit in points of the current instrument. Max.spread(points) - limit for the maximum spread in points. 0 - not used. Deviation(points) - maximum price deviation in points of the instrument. Magic number - EA's magic number. For working with its own orders only. Breakeven - the number of profit points to move the stop loss to breakeven. 0 - not used. Trailing Stop - trailing start level (distance from the current price). 0 - not used. Trailing Stеp - Trailing step. Timeframe for the calculation - the working timeframe of the Expert Advisor. Type of ADX - Type of the indicator used in calculations. ADX or ADX Wilder. ADX Period - Indicator period. Depth of Crossing ADX - depth of intersection of the directional movement lines (+DI and -DI). Start hour - trading start hour. 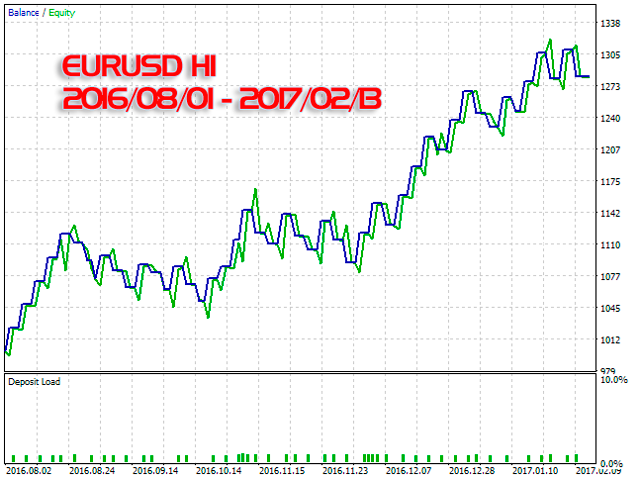 Stop hour - trading end hour. 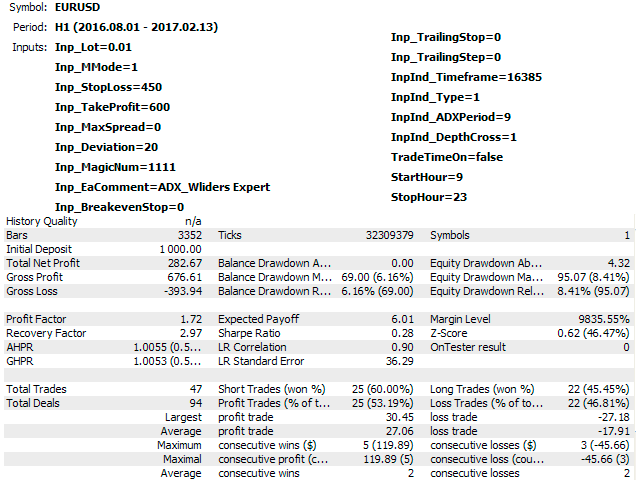 - Added the option "Positions are closed at the opposite signal".